Please refer to our stock # JO65 when inquiring. DESCRIPTION: It's extremely rare to find a complete suite of matching antique Chinese jewelry; it's even more rare to find them in their original box. 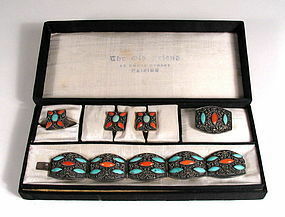 This beautiful set consists of a matching silver filigree bracelet, a pair of earrings, a pin and a ring, all having natural turquoise and coral stones set between delicate scrolling silver wire work. The inside lid of the box is stamped, "The Old Friend, 18 Brass Street, Peiping." Dating from the 1920's, the whole suite is in excellent condition with no losses or chips to the stones. Each piece has a small silver plaque on the back reading, "SILVER/CHINA." DIMENSIONS: Bracelet circumference when closed is 6.75" (17.2 cm, adult medium size). The pin is 1.25" long (3.2 cm); ring and earrings are approximately .75" square (2 cm). The ring is adjustable and the earrings have the original screw-type closures.